Continuing with my maternal 3rd great-grandparents, my mother’s great-great-grandfather on her mother’s side was John Keithley. Once again, we know very little about him and that is mostly from documents about his children or grandchildren. Note from Donna’s daughter, Kay Bauman: My mom died on November 25. The two of us were participating in the No Story Too Small challenge to have one blog post each week devoted to a specific ancestor. This is her unfinished 44th post for that challenge that she last edited on November 16, 2014. My 3rd great-grandfather on my mother’s side was Jacob Lineberry II [or perhaps fourth if you count the two Jacob’s before him who spelled their last name as Leyenberger]. This Jacob was born in Guilford County, North Carolina in about 1770 in the area that would become Randolph County in 1779. While most of his relatives stayed in North Carolina, Jacob moved to what became Carroll County, Virginia, probably sometime between 1790 and 1800 – he was not listed in the 1799 tax rolls for Grayson County, Virginia but was listed for 1800 tax rolls [Carroll County wasn’t formed until 1842]. He married the former Mary Fanning about 1799. Most of the family historians list their marriage as occurring in Randolph County, North Carolina, perhaps due, in part, to the family history written by W.S. Lineberry where he stated “Jacob married and moved to Virginia …” However, land grant records would indicate Mary’s father was already living in Grayson County, Virginia by 1796, which leads me to suspect they may have married in Grayson County rather than Randolph County; no actual records have been located as yet. The website, New River Notes, has a page with links to ‘Enumerations’ with a transcription of early Grayson County tax lists for a number of years. In 1800, Jacob was listed as Jacob Linbery with tax liability for one male over 21 and one horse. The 1805 land tax list showed Jacob’s tax liability as 154 acres with a value of $50 and a tax liability of 24 cents. The 1810 tax list for Jacob was for one white adult male, zero slaves and two horses. 1813 taxes were again for one white adult male, no slaves, but now four horses for a total liability of 64 cents. 1817 was for the same one adult and four horses with a tax liability of 72 cents. The 1824 assessment indicated Jacob and Mary’s oldest son, Francis, was living and taxed on his own with one horse, while Jacob’s assessment was for three adult white males and three horses – a total tax liability of 36 cents. By 1835, Jacob and all his sons were living in separate, taxable, households or taxed in Jacob’s household: two adult males and two horses for 12 cents. The 1820 census lists tick marks for two adults plus five males and six females under 25. One of the six females [age between 16 and 25] is not accounted for in the known names of their children. Their known children were: Francis (1801), Catherine (1803), Jacob P. and George (about 1806), Joseph (1807), Elizabeth (1809), Martha ‘Patsy’ (1812), Mary (1814), Lurana Susany (1815), Jeremiah (1817) and Euphama (1820). Each of the census records indicates Jacob and Mary were born in different decades. The 1830 census record lists a female child born between 1825 and 1830; if Mary were born nearer the 1780 year, it is possible this could be their daughter, although it is also possible she could be a granddaughter or even a neighbor or other relative. The 1840 census has tick marks for Jacob and Mary and their youngest son, Jeremiah. Jeremiah married in 1845, but the 1850 census lists both Jacob and Jeremiah as widowed and, three-year-old Mary, one of Jeremiah’s daughters living in the household. 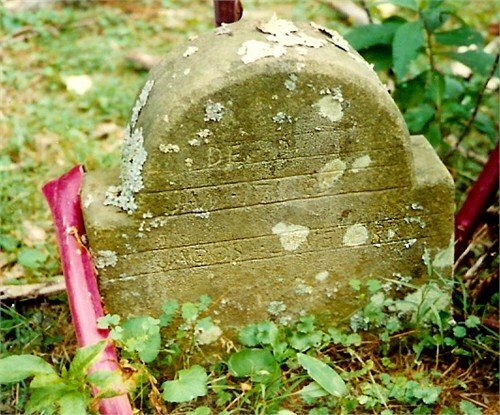 Jacob died in Carroll County, Virginia on January 17, 1852 and is buried in the Old Fanning Cemetery. My 3rd great-grandmother was Mary Fanning Lineberry, daughter of John Fanning, Sr. and Elizabeth Ann Lipps. She was born about 1771 in North Carolina and died about 1846 in Carroll County, Virginia. Little is known of her other than her name and general years of her birth and death. This is quite typical of a woman’s life in the time period prior to the 1850 census when they could at least have their name written on a census but since she died about 1846 she was never recorded on a census. She married Jacob Lineberry IV, probably in Grayson County, Virginia, about 1800. She and Jacob had at least eleven children: Francis (1801), Catherine (1803), Jacob P. [my 2nd great-grandfather] (1805), George (1806), Joseph (1807), Elizabeth (1809), Martha ‘Patsy’ (1812), Mary ‘Polly’ (1814), Lurana (1815), Jeremiah (1817), and Euphamia (1820). When her father died in about 1813, she inherited a share of her father’s land grant. The property was originally in Grayson County but was in the area that became Carroll County in 1842 when county borders were realigned. Jacob purchased the remainder of the land from her brothers and she and Jacob lived there from about 1813 for the rest of their lives. Both her father and her husband are buried on the land so it seems likely that she and her mother are buried there as well. My paternal 3rd great-grandfather was John Willis [1775-1835] of Spartanburg County, South Carolina. He was the oldest child of Richard and Drucilla Pearson Barnett Willis. I have not found basic vital records for John but the International Genealogical Index of the Church of the Latter Day Saints lists his birth date as September 18, 1775 and death date as October 1, 1835; unfortunately, although these dates are reasonable based on other records, I do not know what records they were based on. 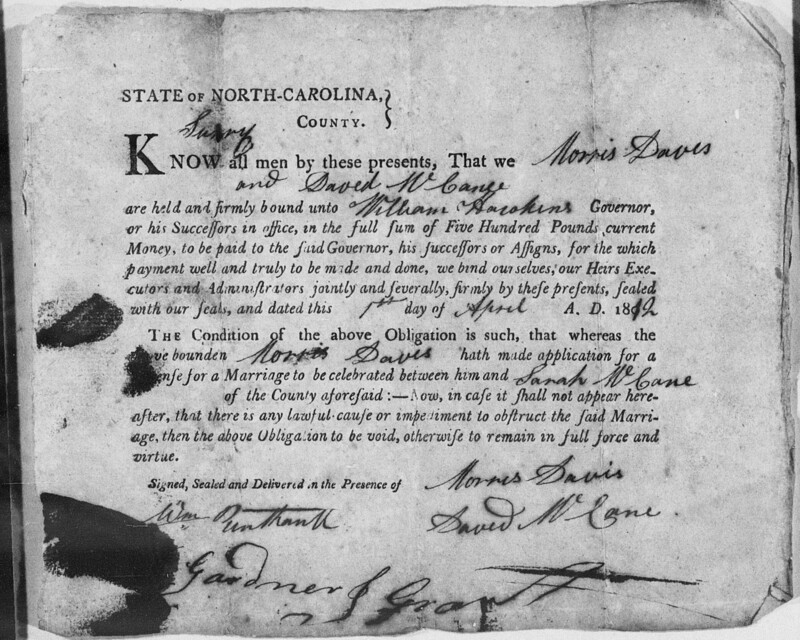 Based on the same International Genealogical Index, John married Martha Patsy Smith on November 21, 1799 in Spartanburg County, South Carolina. The clip from the 1800 census record in which John is enumerated a few rows from his father and listing just a male 16-25 and female 16-25 with no children would support that marriage date. The book, South Carolina Baptists (1), has a list of the members of the Friendship Baptist Church of the Bethel Association of Spartanburg County for the years 1801 through 1803. The list includes John Willis, Martha Willis, Richard Willis, Sr., Richard Willis, Jr., Elizabeth Willis, and William Willis. Martha could have either been John’s wife or his sister; all the names listed are the older children of Richard and Drucilla Willis. Since Drucilla was not listed, it is feasible that married women may not have been listed and that concept makes it likely that Martha Willis was Richard’s daughter rather than John’s wife. The 1810 census is one of particular interest because it lists one of my 3rd great-grandfathers, two of my 4th great-grandfathers and one of my 5th great-grandfathers: John Willis, Richard Willis, Arkilles Foster and William Blackstock, revealing they were all neighbors in South Carolina and each of my descendants of those family groups moved from South Carolina to Fayette County, Alabama. In this record, John and Martha have 4 sons under 10 and 2 daughters under 10. One of the males in the group of three would have been my great-great-grandfather, William Willis. Although John was not a slave holder, my other great-grandfathers were slave holders with Richard and William Blackstock each having five slaves and Arkilles Foster fourteen. For the 1830 census, there were six sons and two daughters still at home. In January 1835, John and his brother-in-law, Holman Rice Smith, entered into an agreement with John’s youngest brothers, Edward and Starling, to allow the younger boys to maintain the home for their parents making sure they were provided and cared for with the younger boys agreeing to a bond of $5,000 in favor of John and Holman Smith. John died a short ten months later in October 1835, predeceasing his father by a little more than two years and his mother by a decade. I have not yet found burial information for John. (1) Townsend, Leah. South Carolina Baptists 1670-1805, Baltimore, Maryland, Genealogical Publishing Co. (Reprint), 2003, pp 135-136.